Water heaters are one of the most overlooked appliances in your home. It’s usually tucked away in a utility closet or somewhere in a dark corner of your basement, never to see the light of day. However, to keep your water heater performing properly, preventative maintenance is something TK and Sons strongly encourages. Water heaters have a typical life expectancy of 8-10 years, so knowing the age of your water heater is very important. If your water heater is 8-10 years old you may experience discolored water at your faucets or if you’ve noticed that your hot water seems to be running out much faster than it used to. Give us a call and upon inspection we can determine if your water heater needs simple maintenance or needs to be replaced. If replacement is needed, TK and Sons has it covered. We can provide you with all of the information needed to choose the best water heater for your home or business. 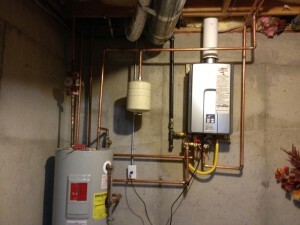 TK and Sons will then install your new water heater, in most cases on the same day.